The tour will commence at 4:00 p.m. in the Hesburgh Library Lobby and will continue to three sites across campus where liturgical vestments are exhibited. Guests will be guided through the Sacristy Museum at the Basilica of the Sacred Heart, Rare Books and Special Collections at the Hesburgh Library, and the Scholz Family Gallery at the Snite Museum of Art. A panel discussion will be held in the Annenberg Auditorium of the Snite Museum of Art (lower level) following the tour, and then a reception in the Atrium of the Snite. Thursday, April 18 at 5:00pm | The Italian Research Seminar: “De Sica’s Genre Trouble: Rom-Coms against Fascism?” by Prof. Lorenzo Fabbri (Minnesota, Twin Cities). Sponsored by the Center for Italian Studies. The spring exhibit, As Printers Printed Long Ago. The Saint Dominic’s Press 1916-1936, curated by Dennis Doordan (Emeritus Professor, Notre Dame School of Architecture), opened in January and runs through the summer. The exhibition features different types of publications and posters produced by Saint Dominic’s Press, setting the story of the press within the larger history of the private press movement in England and examining its artistic as well as literary achievements. The current spotlight exhibits are: Purchas his Pilgrimes and John Smith (March 2019), and The Work of Our Hands: A multi-venue exhibition of liturgical vestments organized in conjunction with the Notre Dame Forum 2018-19: “The Catholic Artistic Heritage: Bringing Forth Treasures New and Old” (March – early June 2019). If you would like to bring a group to Special Collections or schedule a tour of any of our exhibits, please email rarebook @ nd.edu or call 574-631-0290. We will reopen at 9am on Monday, April 22, 2019. Thursday, February 21 at 5:00pm | The Italian Research Seminar: Presentations by M.A. Students in Italian: Gabriella Di Palma and Guido Guerra. Sponsored by Italian Studies at Notre Dame. Tuesday, February 26 at 3:30pm | Book Celebration: Roman Sources for the History of American Catholicism, 1763–1939. Welcome and remarks by: Diane Walker (Hesburgh Libraries); Angela Fritz (University Archives); Jean McManus (Hesburgh Libraries); Stephen Wrinn (Notre Dame Press); and Kathleen Sprows Cummings (Cushwa Center). Refreshments to follow. 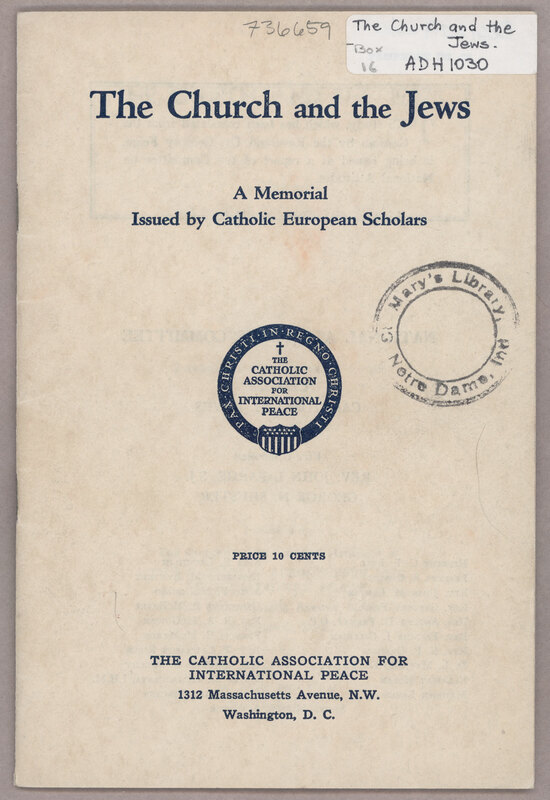 Sponsored by Hesburgh Libraries, University Archives, Cushwa Center for the Study of American Catholicism, and Notre Dame Press. Thursday, February 28, 9:00am to 11:00am | Documenting Girls and Girlhood — Library Collections on Display. In association with the International Girls Studies Association meeting, and the University of Notre Dame’s International Gender Studies Conference, Hesburgh Libraries’ Rare Books and Special Collections will host a display on the culture, literature, and history of girls and girlhood. Drawing on the Irish and American collections, there will be a fascinating array of books, manuscripts, periodicals, posters and artifacts demonstrating religious, rebellious, domestic, and literary girlhoods. Rachel Bohlmann, American history and gender studies librarian, and Aedín Clements, Irish studies librarian, will be available to provide tours and answer questions. The current spotlight exhibits are: Theresienstadt (Terezín), in remembrance of all the victims of the Holocaust (January – February 2019), and Creeley/Marisol: Presences, an exhibit occasioned by the 2018 publication of a critical edition of Presences, edited by Stephen Fredman, Professor Emeritus of English at the University of Notre Dame (January – February 2019). This Sunday, January 27, is International Holocaust Remembrance Day. 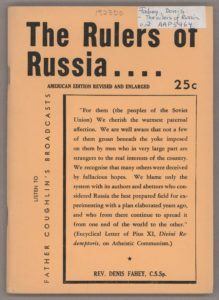 The library is commemorating it in a number of ways: a program on Friday, January 25, centered on American Catholic newspaper coverage of the Holocaust; a small exhibition on prisoners held at the German Nazi concentration camp, Theresienstadt (Terezín); and this post, which features selections from one of the library’s most notable collections, Catholic pamphlets. The pamphlets shown here display a range of views held by Catholics about Jews, although the larger collection also includes pamphlets published by non-Catholics (Jews and Protestants) about anti-Semitism and Jews. 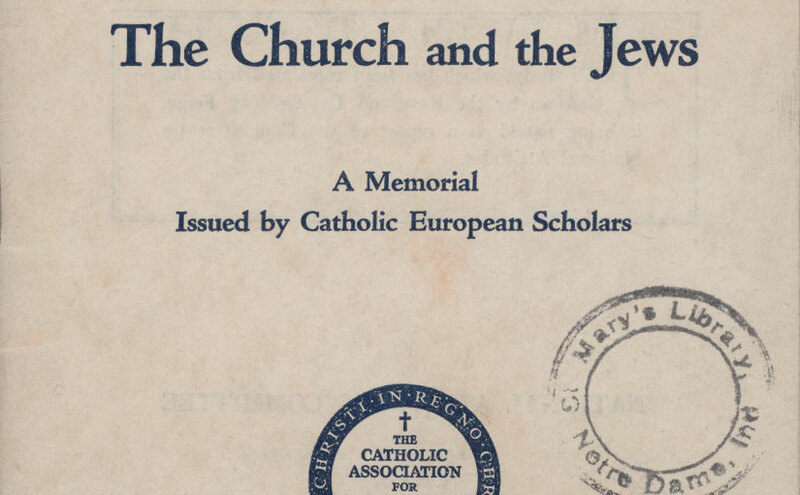 In 1937 the Catholic Association for International Peace in Washington, D.C. published an English translation of The Church and the Jews: A Memorial Issued by Catholic European Scholars. 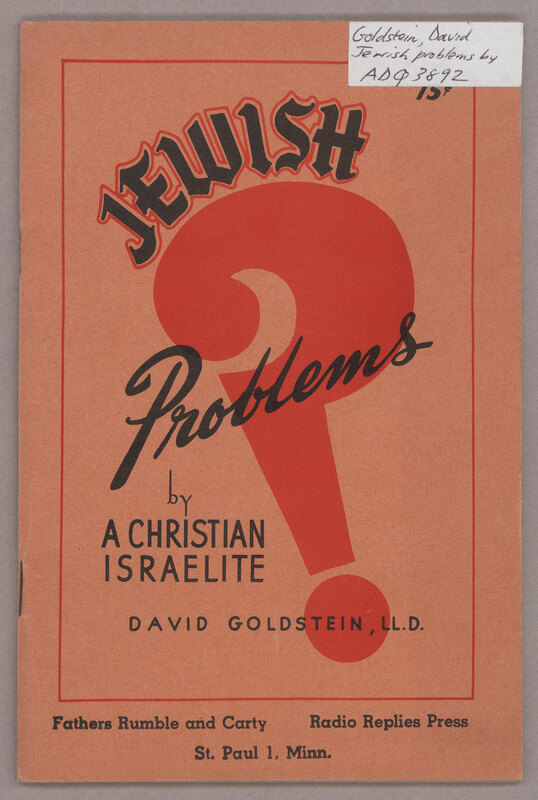 It had first been published in German, anonymously, as its writers argued against German anti-Semitism even as they called for the conversion of Jews to Christianity. 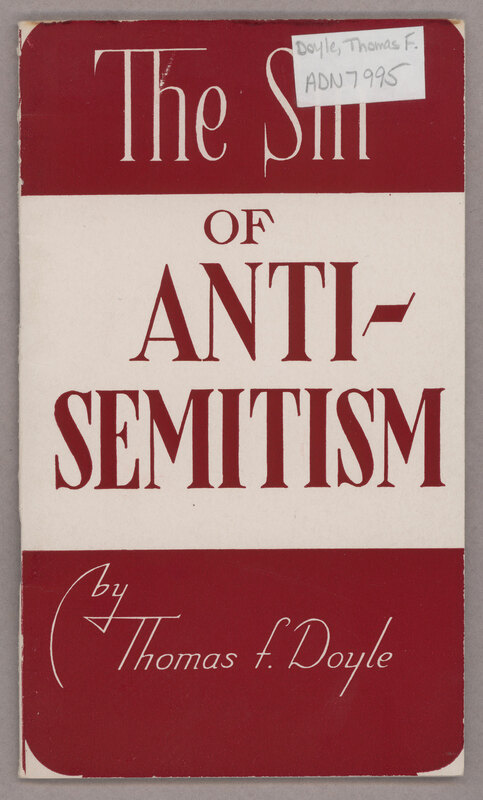 Three years later Thomas F. Doyle, an American priest, published The Sin of Anti-Semitism in which he stated flatly that “anti-Semitism has long existed in the United States.” He admonished his fellow Catholics to remember the commandment to love your neighbor. It was an idea, he argued, that for Catholics, made a mockery and an insult of anti-Semitism. Another Jewish convert to Catholicism and a cleric, John (originally Johannes) M. Oesterreicher, fled German-held Austria in 1938. 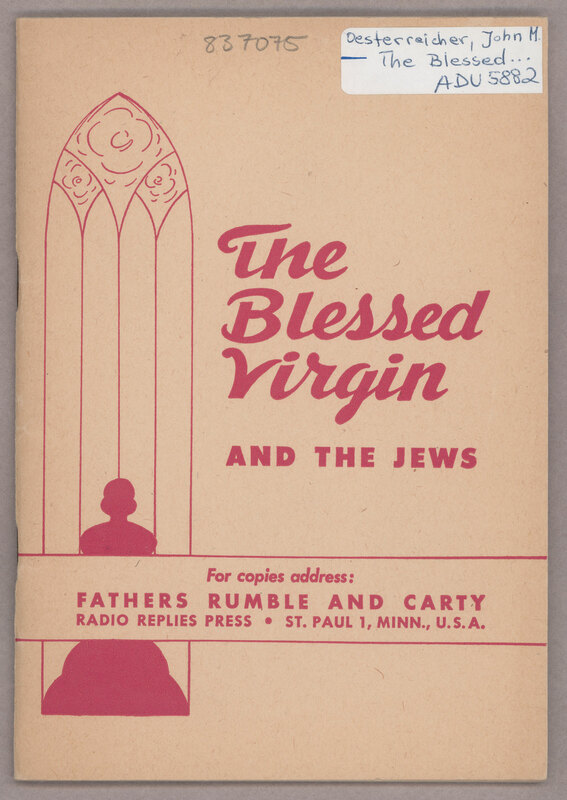 In a pamphlet first published in 1942, The Blessed Virgin and the Jews, he condemned Nazis’ anti-Semitism (and their attacks on Catholics) and called for Jews to convert, and he cited examples of Jews who had done so. 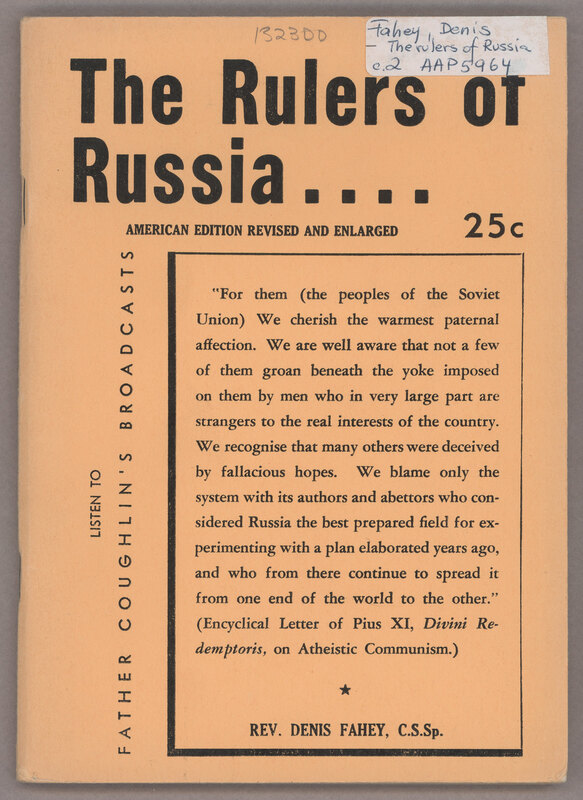 The collection also includes virulent anti-Semitic views, as in The Rulers of Russia, an American edition of an Irish pamphlet by a priest, Denis Fahey C.S.Sp. 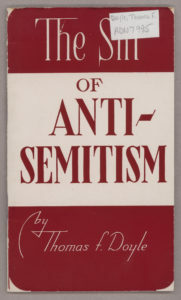 Published in the US in 1940, Fahey attacked the Soviet Union in part because he claimed that an international cabal of Jews had dominated the Bolshevik Revolution and subsequent Communist rule there. 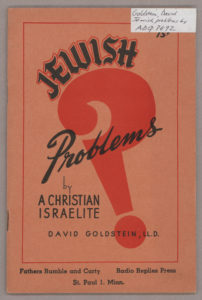 The pamphlets shown here represent just a few examples of the debate over anti-Semitism during this critical period. We highlight them to commemorate International Holocaust Remembrance Day. Tuesday, November 6 at 3:00pm | Workshop: Alternate Careers in Rare Books, Special Collections, Archives, and Museums. Wednesday, November 7 at 3:30pm | Black Catholic History Month: “The Black Catholic Movement: The First 50 Years, 1968–2018” by Fr. Clarence Williams, CPPS, Ph.D. Co-sponsored by the Cushwa Center for the Study of American Catholicism, Hesburgh Libraries, and the University Archives. Friday, November 9 at 3:00pm | Operation Frankenstein: “Melodramatic Frankenstein: Radical Content in a Reactionary Form” by Jeff Cox (University of Colorado Boulder). Co-sponsored by the Department of English and the Indiana Humanities Council. Thursday, November 15 at 4:30pm | Iberian & Latin American Studies: “Language and Power: Searching for the Origins of Catalan Linguistic Identity” by Vicente Lledó-Guillem (Hofstra University). Co-sponsored by the Department of Romance Languages and Literatures, the Institute for Scholarship in the Liberal Arts, the Medieval Institute, the Nanovic Institute for European Studies, and the Center for the Study of Languages and Cultures. Thursday, November 29 at 5:00pm | The Italian Research Seminar: “Dante’s Florentine Intellectual Formation: From Quodlibets to the Vita nuova” by Lorenzo Dell’Oso (Ph.D. Candidate, Notre Dame). Sponsored by Italian Studies at Notre Dame. The exhibit In Solzhenitsyn’s Circle: the Writer and his Associates runs through the end of the semester. The current spotlight exhibits are Frankenstein 200 (August – December 2018) and Delamarche’s États-Unis de l’Amérique septentrionale: The United States in 1785 (November – December 2018). Thanksgiving Break (November 22-25, 2018). Thursday, April 5 at 5:00pm | A talk on the reception of Medieval Catalan poet Ausiàs March in Early Modern Iberia, by Albert Lloret (UMass Amherst). Sponsored by Iberian and Latin American Studies, Department of Romance Languages and Literatures. Wednesday, April 11 at 4:30pm | “Centering Black Catholics, Reimagining American Catholicism” by Matthew Cressler (College of Charleston). Sponsored by the Cushwa Center for the Study of American Catholicism. Thursday, April 19 at 5:00pm | The Italian Research Seminar: “From Surface to Symptom and Back Again: Reading Isabella d’Este’s Correspondence” by Deanna Shemek (University of California, Santa Cruz). Co-sponsored by Italian Studies at Notre Dame and the William and Katherine Devers Program in Dante Studies. Thursday, April 26 at 5:00pm | “Towards a New Biography of Dante Alighieri” by Paolo Pellegrini (Verona). Co-sponsored by Italian Studies at Notre Dame and the William and Katherine Devers Program in Dante Studies. 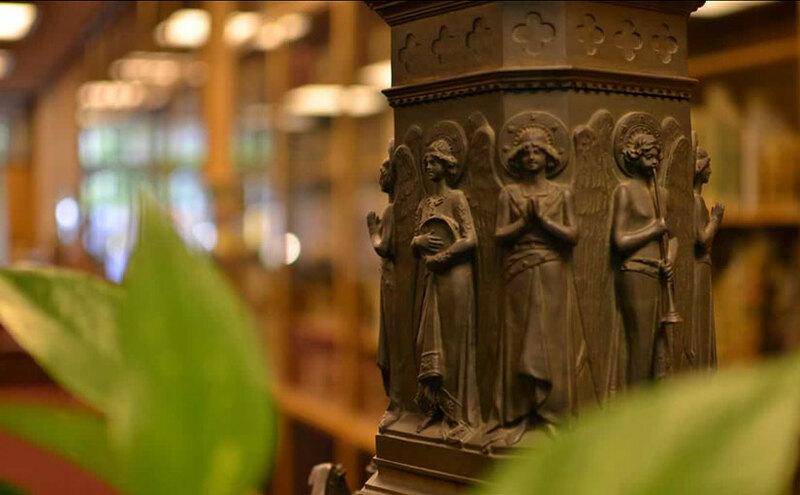 Friday, May 4 at 1:00pm | Awards ceremony for the annual Undergraduate Library Research Award (ULRA), followed by a reception in the Special Collections Seminar Room (103 Hesburgh Library). The main exhibit this spring is In a Civilized Nation: Newspapers, Magazines, and the Print Revolution in 19th-Century Peru. This exhibit is curated by Erika Hosselkus and draws on strengths of Rare Books and Special Collections’ José E. Durand Peruvian History collection. Together these items offer diverse perspectives on Peruvian political events and cultural and religious practices and preferences from the colonial era, through the country’s birth in 1825, and beyond the turn of the twentieth century. The spotlight exhibits during early April are From Distant Waters: Whaling Manuscripts in Special Collections and Baseball and Tin Pan Alley: Sheet Music from the Joyce Sports Collection, both curated by George Rugg. The baseball exhibit will end mid-month, with the exhibit Chaste, Choice and Chatty: Irish-American Periodicals of the Nineteenth Century, curated by Aedín Ní Bhróithe Clements, opening for the second half of the month and continuing through the summer. This digital exhibit expands on the current exhibit on display in Special Collections. It displays examples of American Catholicism expressed through (mostly) printed texts from 1783 through the early 1840s. 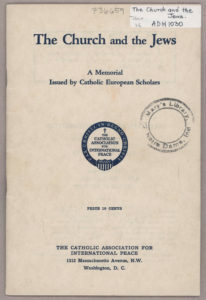 They include the earliest Catholic bibles published by Mathew Carey, and editions of Thomas à Kempis’ The Imitation of Christ used and produced in the United States; polemical pamphlets with sexual and political subtexts that flew back and forth across the Atlantic; no-holds-barred dueling sectarian newspapers; books and pamphlets created in reaction to mob violence against the Ursuline convent school near Boston; and official reports that mapped the Church’s growth and growing pains. Questions and comments may be directed to Rachel Bohlmann and Jean McManus. The physical exhibition continues to be open to the public through August 11, 2017. Thursday, June 1 at 2:00pm | Exhibit Talk — “21st Century Digital Approaches to Rethinking 19th Century Catholic Print” – Kyle Roberts (Loyola University Chicago). Monday through Friday, June 12-16 at 9:00am to noon | RBSC Nuts & Bolts — ARCHIVES! Intensive Workshop for Conducting Archival Research – Rachel Bohlmann, Ph.D. (Notre Dame, American History Librarian) and Julie Tanaka, Ph.D. (Notre Dame, Curator in Special Collections). 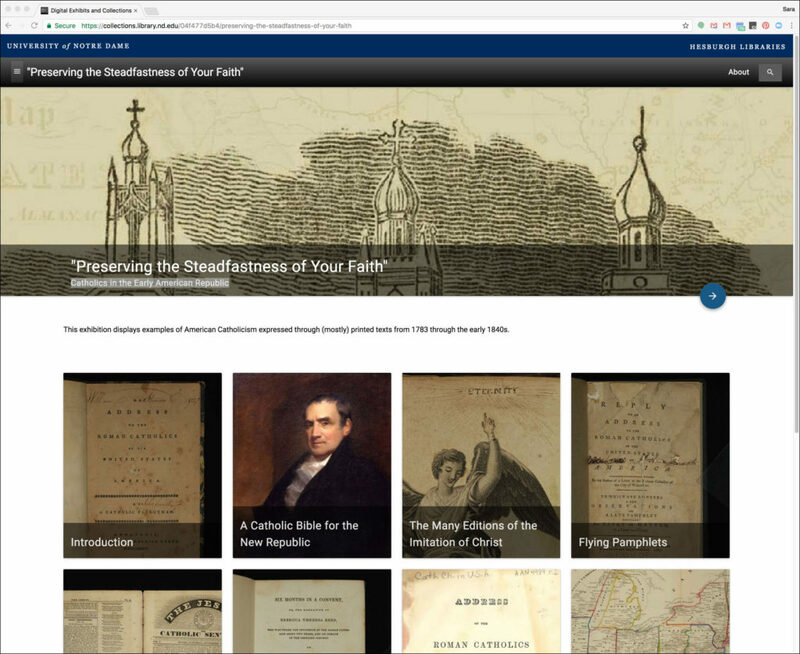 The current exhibit, “Preserving the Steadfastness of Your Faith”: Catholics in the Early American Republic, will run through the summer and close on August 11, 2017. The current spotlight exhibit, “Exhibition of Artifacts from Mother Cabrini’s Archive”, will close May 19. The summer spotlight exhibit will highlight North American Antebellum friendship albums and will open the following week. 9:00am to 5:00pm, Monday through Friday. and the Fourth of July. Thursday, April 13 at 5:00pm | The Italian Research Seminar — “Visualizing Fascism” by Ruth Ben-Ghiat (New York University). Sponsored by Italian Studies at Notre Dame. Thursday, April 27 at 5:00pm | The Italian Research Seminar — “Living on borders: Cityscapes in transformation in Italian literature and cinema of the ‘Economic Miracle’ ” by Alberto LoPinto (Notre Dame). Sponsored by Italian Studies at Notre Dame. 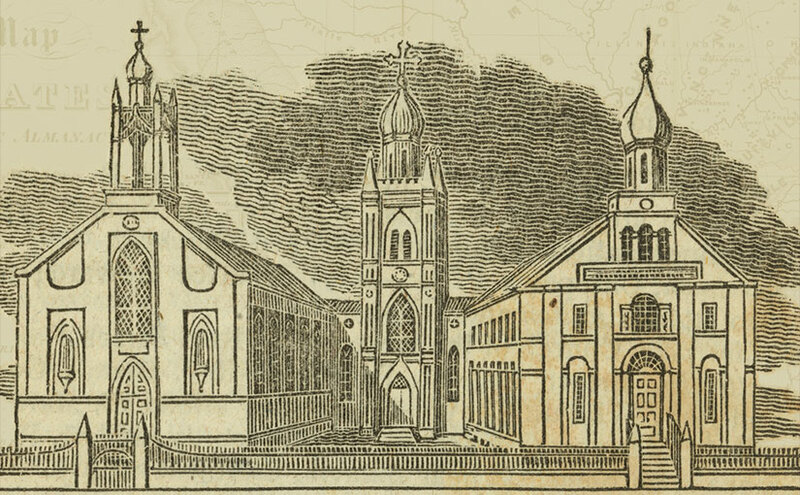 “Preserving the Steadfastness of your Faith”: Catholics in the Early American Republic. To schedule a class or group tour, please contact Rachel Bohlmann via email or phone: (574) 631-1575. Today’s coloring sheet comes from our current exhibit, “Preserving the Steadfastness of Your Faith”: Catholics in the Early American Republic. 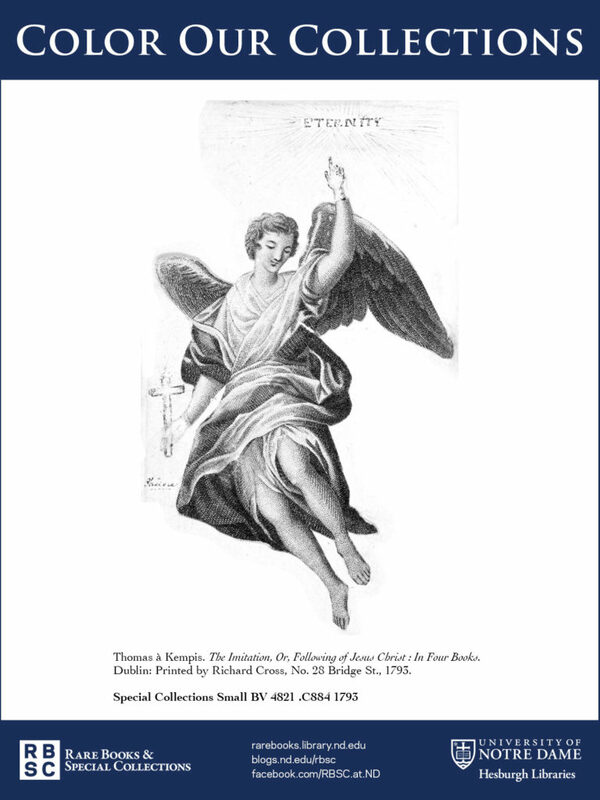 This exhibition displays examples of American Catholicism expressed through (mostly) printed texts from 1783 through the early 1840s and is curated by Rachel Bohlmann (U.S. History & American Studies)and Jean McManus (Catholic Studies). The exhibit is open to the public through August 11, 2017. Wednesday, March 22 at 4:00pm | Exhibit Talk — “Saint Elizabeth Seton: A Reading Life” by Catherine O’Donnell. Co-sponsored by the Hesburgh Libraries and the Cushwa Center for the Study of American Catholicism. Thursday, March 30 April 27 at 5:00pm | The Italian Research Seminar — “Living on borders: Cityscapes in transformation in Italian literature and cinema of the ‘Economic Miracle’ ” by Alberto LoPinto (Notre Dame). Sponsored by Italian Studies at Notre Dame. Join co-curators Rachel Bohlmann (American History Librarian) and Jean McManus (Catholic Studies Librarian) for a guided tour Thursdays at 12:30 pm through March (excluding Spring Break, March 16), and learn more about American Catholic history held in the library’s Rare Books and Special Collections and ND Archives. Tours will last up to an hour. Spotlight Exhibits: Bram Stoker’s Lecture on Abraham Lincoln and The Nathaniel Rogers Sermon Notebook, ca. 1634-1645.